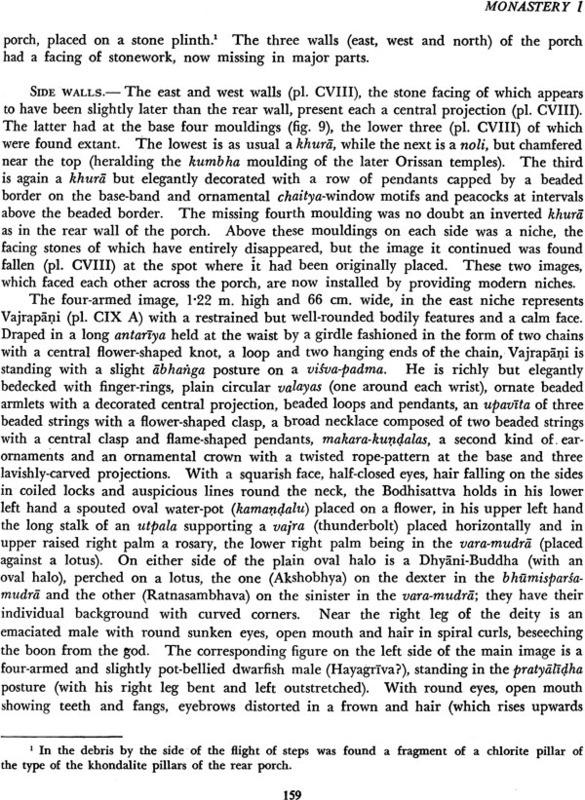 With the release of this volume embodying the detailed report on the Stupa-area and Monastery I as well as the associated sculptures found during excavations at the site on the top of the Ratnagiri hill, I feel considerably relieved of the responsibility I took upon myself some two decades back to unveil before the world the glory Ratnagiri. All these years my conscience kept me restless; for, I firmly believe archeological excavations, if not properly documented and reported, are destruction evidence of the sites. No doubt the report should have been published much but I will not try to enumerate the difficulties and involvements, following my from the Eastern Circle, as excuses for this inordinate delay. 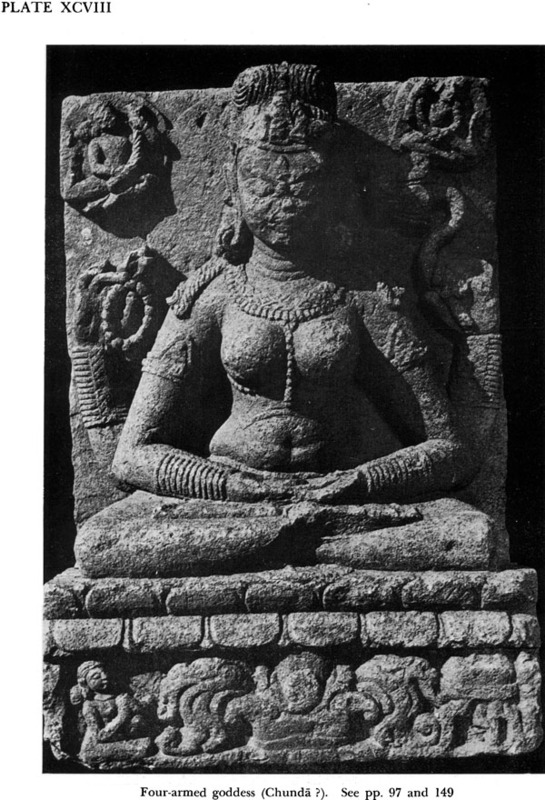 It is my hope that the on of this volume and the following one which is likely to go to the press shortly stimulate further research on many less-known aspects of the history of Buddhism and development of Buddhist art and architecture in Orissa. It was a venture of considerable magnitude, involving lot of hardship, perseverance dedicated service. The excavations which commenced in February 1958 were spread tour field-seasons and these seasons covered the hotest months of the year. In the season, a large part of the mound which yielded the main stupa along with other was uncovered, the remaining portion having been dug in the next season. The second season was concentrated on the Raui-pukhuri mound, as a result of the extensive remains of two monasteries (numbered 1 and 2) were brought to Apart from completing the excavations at the two monasteries, we unearthed the of Temple I in the third season. The fourth season saw the operation in the immediately to the south of Monastery 2 and Temple 1 as well as at an inconspicuous isolated mound to the north-north-east of Monastery I; the last mound yielded a singled monastery. It was by no means a small achievement but without the reports documents published all these would have been lost to us except the bare structures which were exposed by spade and pickaxe. 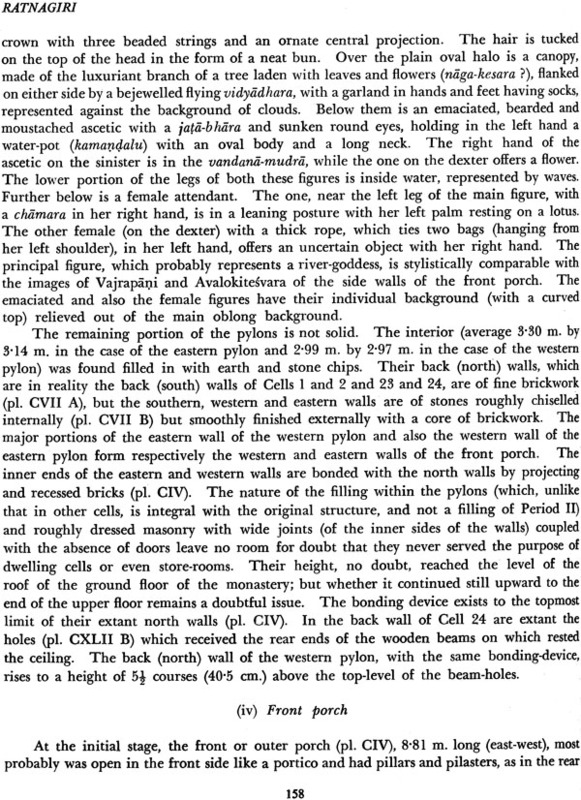 In pursuance of the established practice every antiquity discovered in the course of the digging was documented and measured. This brings me to the question of measurements followed in the volume. 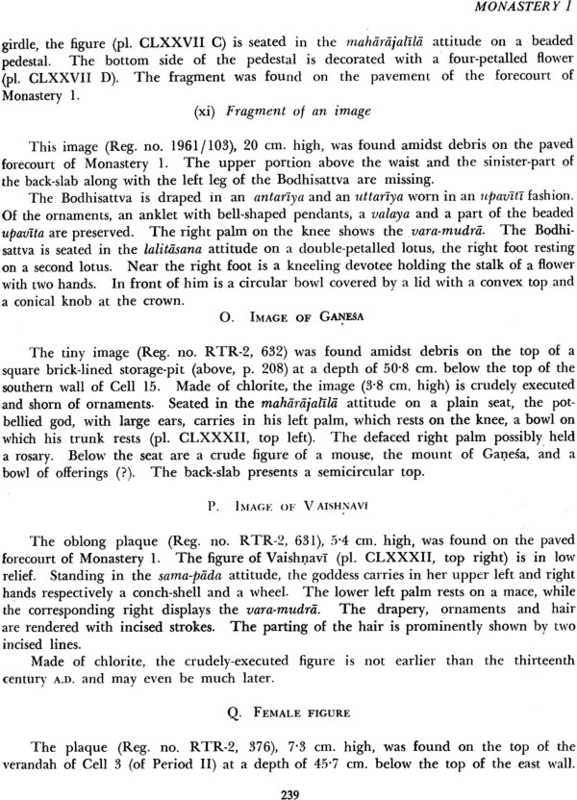 At the e of the excavation the scale in terms of feet and inches was used in taking detailed measurements. As these measurements have been converted into the metric system while finalizing the report, there is a likelihood of difference by a couple of mm. I took care to record as many measurements as possible under the apprehension of the likely change of measurements of the structures during the course of the repairs. The work of preserving an excavated site is as important as the excavation itself. 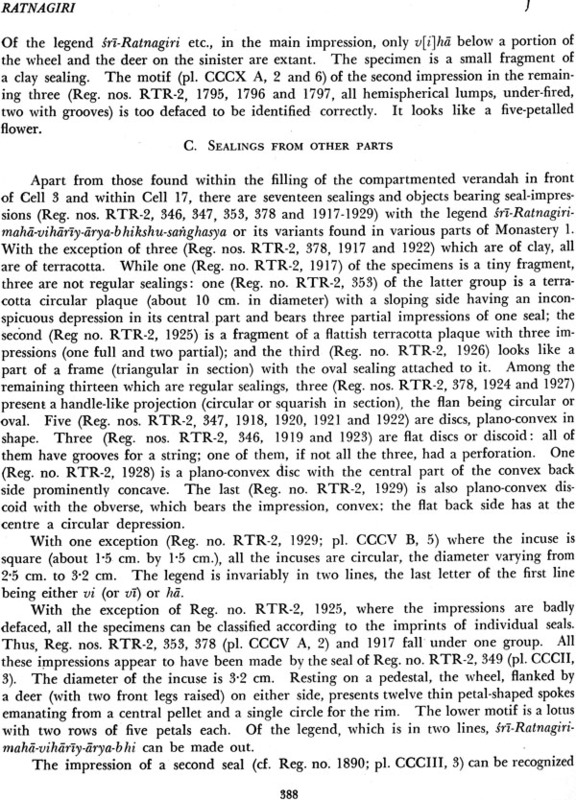 I arranged in such a way that from the second season onwards the works of excavation and conservation went on side by side, as I felt that the excavated remains, unless properly understood by the Conservation Assistant tinder the guidance of the excavator, cannot be preserved as per the original. 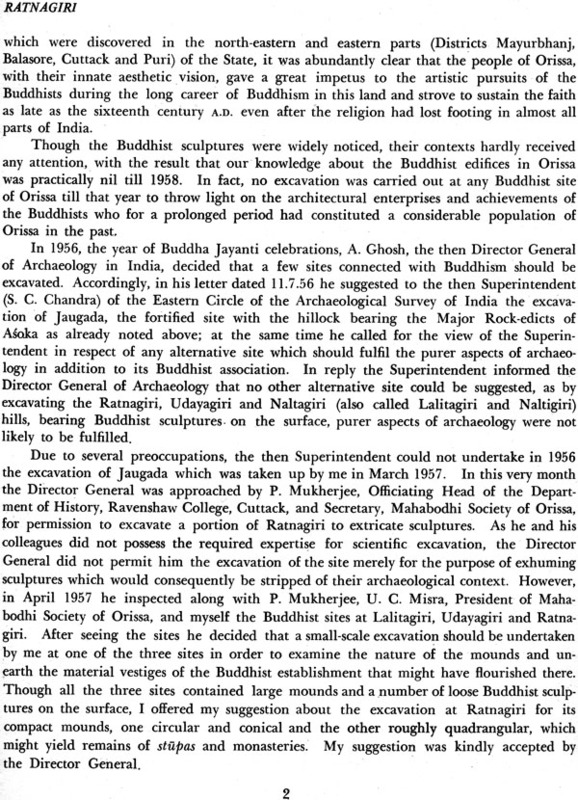 Most of the remains were repaired commendably by Shri B. Ghosh, Conservation Assistant of the Sub-circle covering Orissa, during my tenure of office as the Superintendent (redesignated as Superintending Archaeologist later on’ of the Eastern Circle. 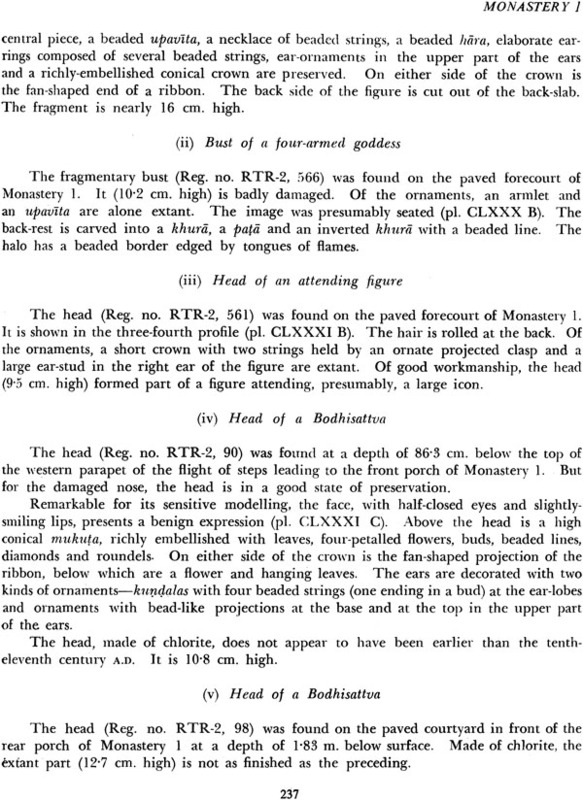 The conservation works were restricted to the available height of the excavated remains in most cases. Wherever restoration of missing parts was undertaken, sufficient care was taken to maintain the original character. 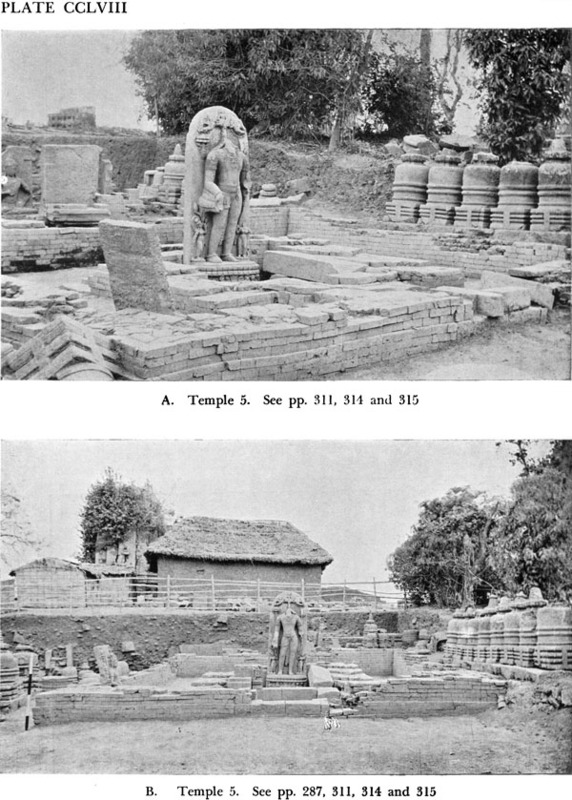 A few minor stupas were restored to their original heights mostly with the dismembered slabs found around them. 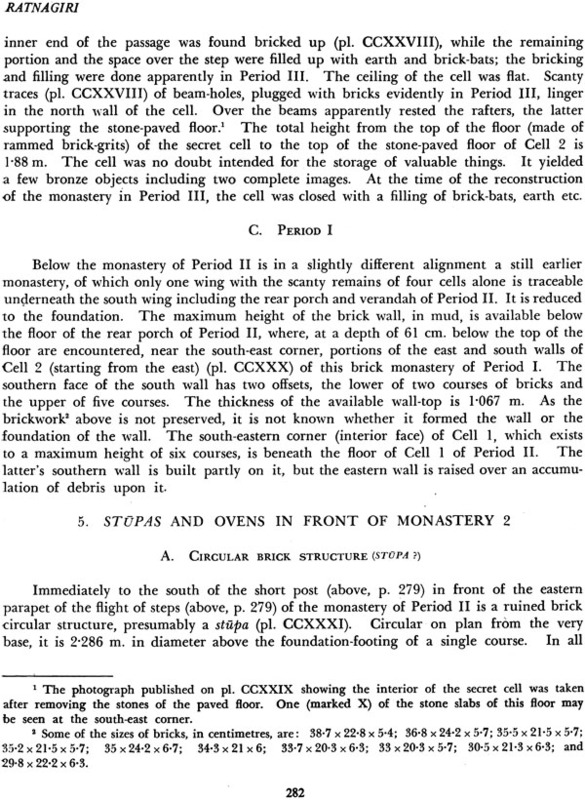 The major restoration was attempted to the stone peripheral 4a11 of Monastery 1 which had been badly shattered. 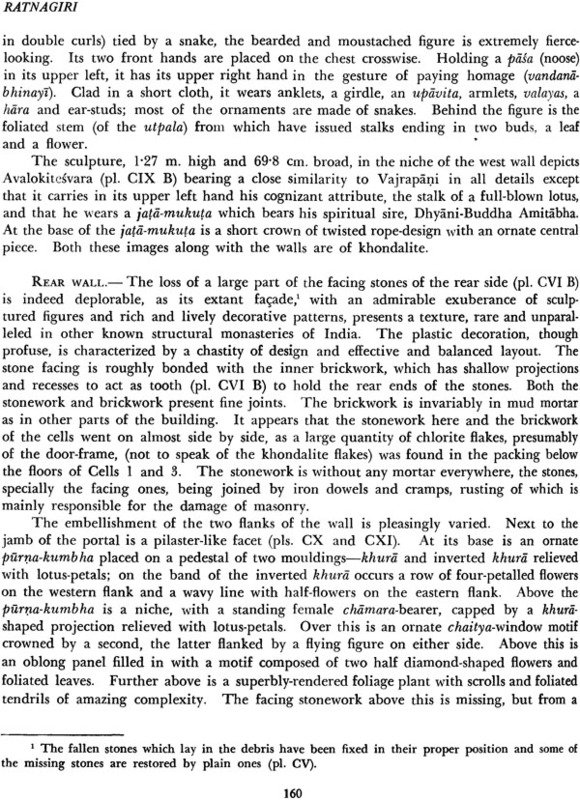 Many of the stone slabs of this partially-collapsed wall of plain ashlar masonry were fortunately available. Taking into account the maximum extant height of the western flank of this wall, the height of the other sides was raised. But at no place the height was increased without any authentic data. The lines marked by the ancient masons on the courses of stones as well as the sides of dislocated slabs with cuts in such a way as to be fitted together helped us considerably in the restoration. 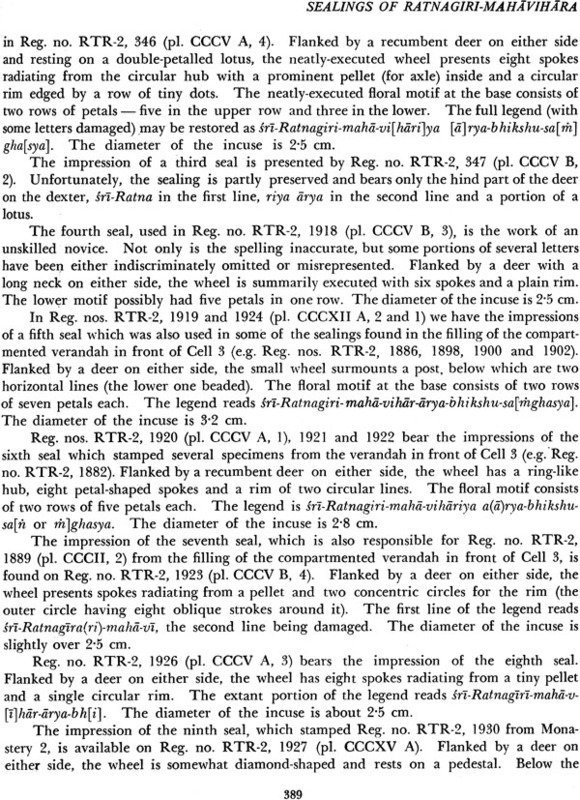 While repairing and restoring both the stonework and brickwork, lime-cement mortar has been used for imparting stability, though originally the stonework was dry (facing stones in many cases having been clamped together by iron cramps and dowels) and the brickwork was in clay mortar. The facing bricks have been chiselled and smoothened by rubbing as in the case of the original brickwork. The major part of the repairs to brickwork was carried out by old bricks and brick-bats collected from the debris. Later conservation works after my departure mostly consisted of, apart from the repair to the paved courtyard of Monastery 1, the erection of a roof over the shrine of Monastery I, the raising of the height of the walls and construction of roofs over the shrine of Monastery 2 and Temples 4 and 5 for providing sheds over the images and the laying of a stone-paved floor over the original floor (of rammed brick-grits and brick-dust) of the shrine of Monastery 1. Some of these works are not up to my expectation; and this is of course natural when the conservator had not the occasion to work at the site during the excavations. My excavation team was a small but a compact one, but each one of them proved to be a selfless worker. In the excavations I was assisted throughout by Shri Sushanta Kumar Mukherji, at that time Technical Assistant, Shri Kalachand Das, Photographer, Shri Karnal Kumar Biswas, Surveyor and Shri Sanat Kumar Ghosh, Surveyor, and occasionally by Shri Sudhir Kumar Neogi, Draftsman, and Shri Nani Gopal Banerji, Draftsman, all belonging to the office of the Eastern Circle. 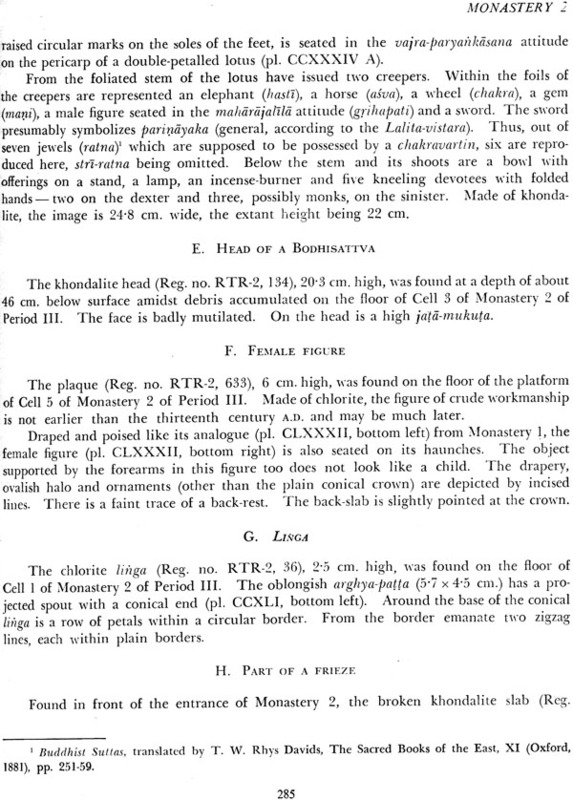 Apart from the preparation of the contour-map of the Ratnagiri hill, Shri Biswas and Shri Ghosh shouldered ungrudgingly the responsibility of preparing the ground-plans of all the structures by plotting the stones and bricks and also elevations of some parts of the structures. 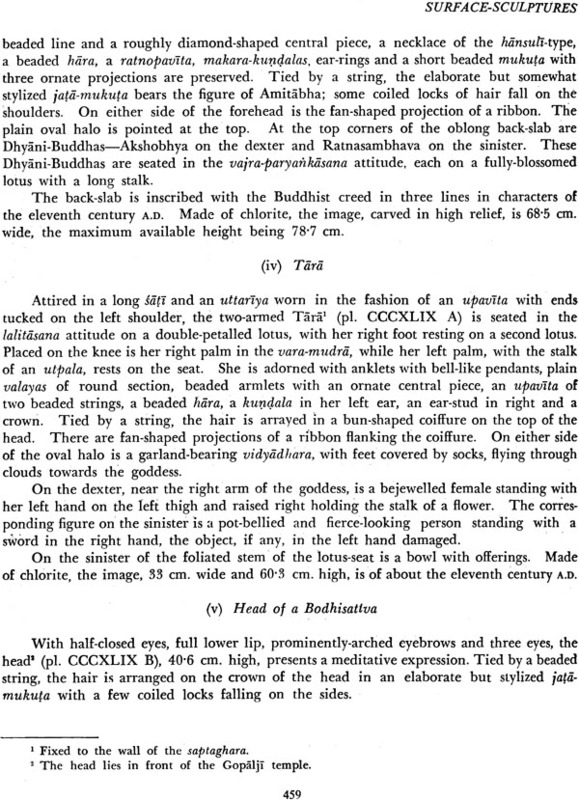 While Shri Banerji drew the sections, Shri Neogi prepared the elevation of the western side of the main stupa. All of them except Shri Biswas and Shri Ghosh have since retired, but I am sure that their contribution in bringing the excavation to a successful conclusion will always be remembered. I recall here with gratitude the devoted and zealous services rendered by all of them. While preparing the final report I received close co-operation from many officers of the headquarters office in New Delhi. Shri Lalit Kumar Jam, Drawing Officer, with a great zeal and patience collated sheets of original drawings in pencil and produced fair copies for publication. 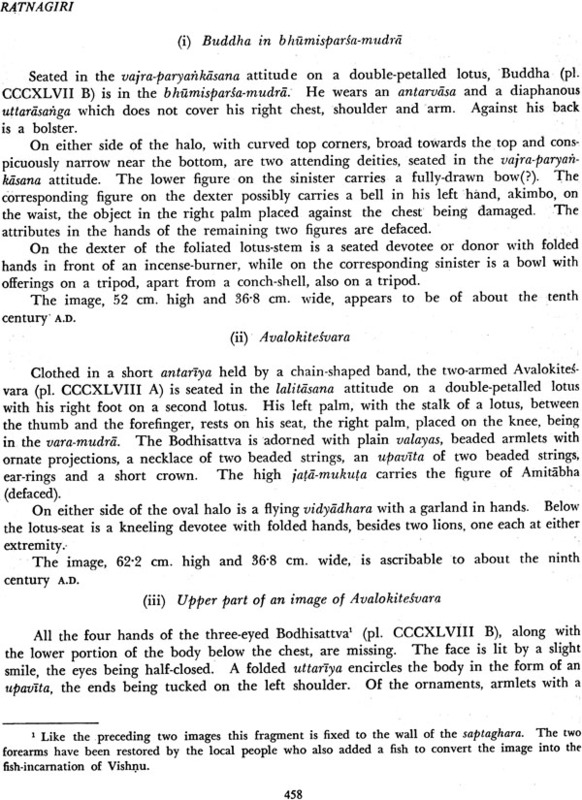 He was also responsible for the line-drawing figure presenting the elevation of the southern side of the main stupa. While Shri A. 4T. 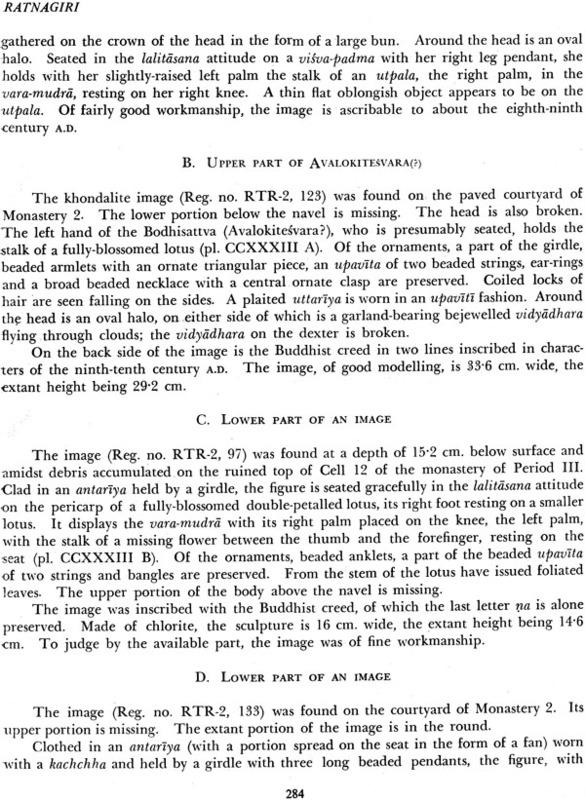 P. Ponnuswamy, Senior Artist, made the line-drawings showing the front elevation of the façades of the shrine in Periods I and II, Shri Saktipada Chat that their contribution in bringing the excavation to a successful conclusion will always be remembered. I recall here with gratitude the devoted and zealous services rendered by all of them. While preparing the final report I received close co-operation from many officers of the headquarters office in New Delhi. Shri Lalit Kumar Jam, Drawing Officer, with a great zeal and patience collated sheets of original drawings in pencil and produced fair copies for publication. 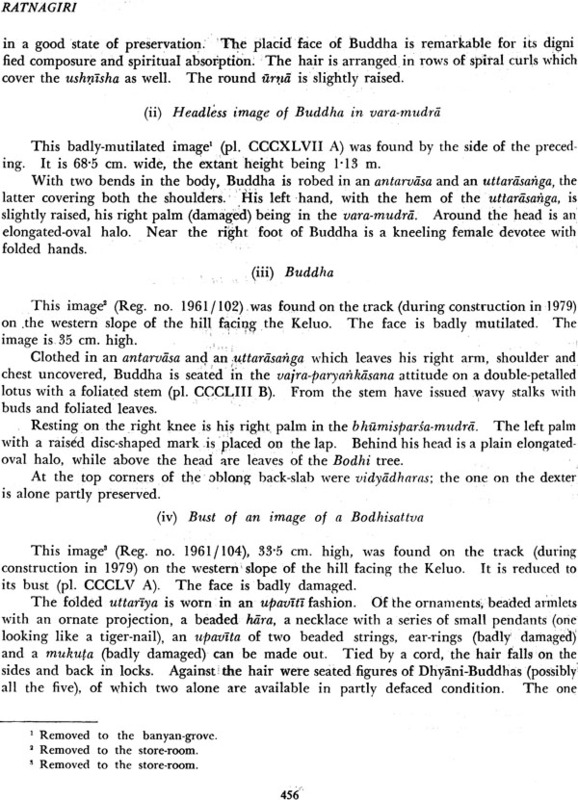 He was also responsible for the line-drawing figure presenting the elevation of the southern side of the main stupa. While Shri A. 4T. 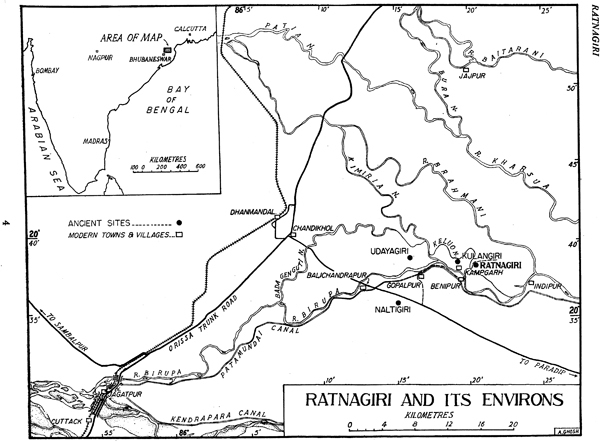 P. Ponnuswamy, Senior Artist, made the line-drawings showing the front elevation of the façades of the shrine in Periods I and II, Shri Saktipada Chatterjee, also Senior Artist, drew the frame of the portal of Monastery I. Shri Ajit Kumar Ghose, Senior Draftsman, apart from assisting in tracing, prepared the map of Ratnagiri and its environs. 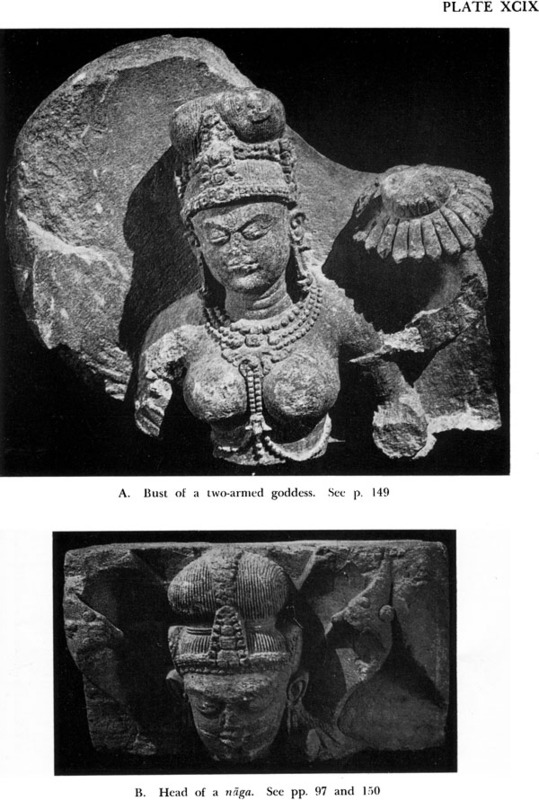 Shri Ranjit Datta Gupta, Photo Officer, Shri Raj Kumar Sehgal, Senior Photographer, and Shri Rajbir Singh, Photographer, took photographs of some small antiquities. To all these persons my grateful acknowledgement is due. I am deeply indebted to Prof. D. C. Sircar for his contribution in respect of the two inscriptions on the stelae and also to Dr. Z. 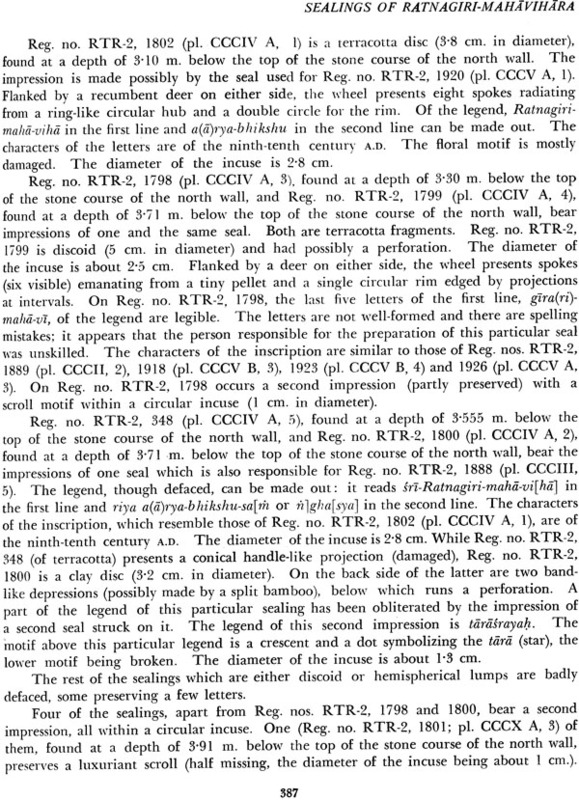 A. Desai, Director (Epigraphy), for the identification of two coins. 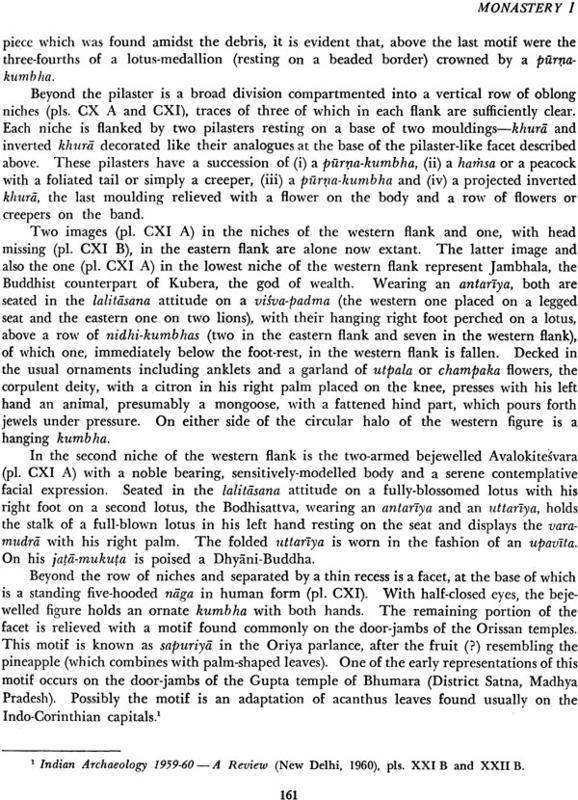 My thanks are also due to Shri Brij Bhushan Datta who with great patience and commendable accuracy typed out the entire manuscript, a task of easy due to the occurrence of numerous diacritical marks. I am thankful to Shri H. Sarkar, Director (Publication), for his useful suggestions in die preparation of the report. Shri Sarkar and Shri Chhering Dorje, Deputy Superintending Archaeologist, assisted me in going through the proof. To Shri B. K. Thapar, the former Director General and my predecessor, I am greatly beholden for his warm interest in the publication of this Report. 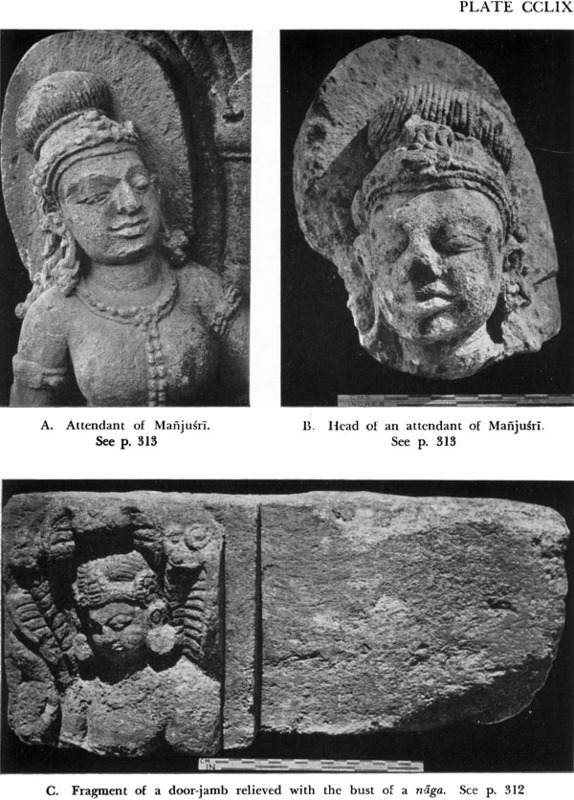 While writing this preface my mind automatically goes back to those seasons when the local people of the Ratnagiri village came forward to participate, directly or indirectly, in the excavations. I am fortunate in having a very pleasant people around me at the time of the excavation and I am reminded of what Sir John Marshall once wrote: ‘let us not forget that it is to the toil and sweat of the diggers that, first and foremost, we owe the vast majority of our archaeological treasures’. terse, also Senior Artist, drew the frame of the portal of Monastery I. Shri Ajit Kumar Ghose, Senior Draftsman, apart from assisting in tracing, prepared the map of Ratnagiri and its environs. 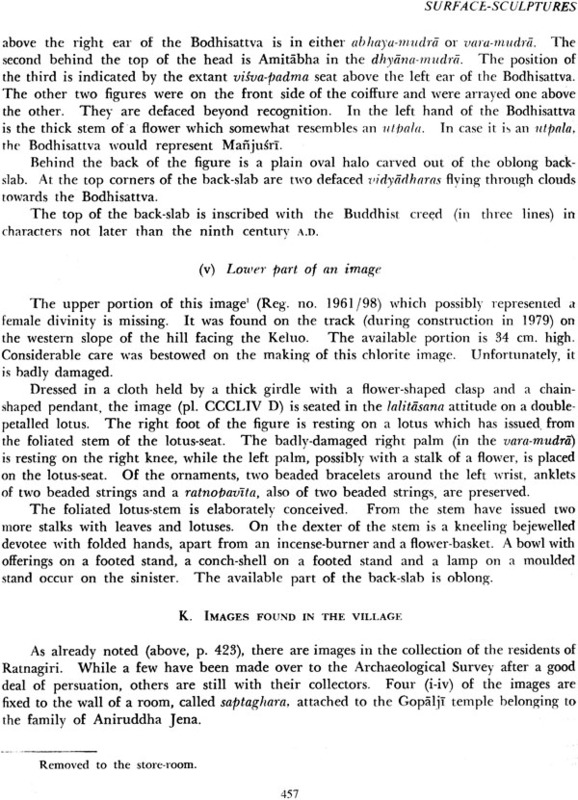 Shri Ranjit Datta Gupta, Photo Officer, Shri Raj Kumar Sehgal, Senior Photographer, and Shri Rajbir Singh, Photographer, took photographs of some small antiquities. To all these persons my grateful acknowledgement is due. 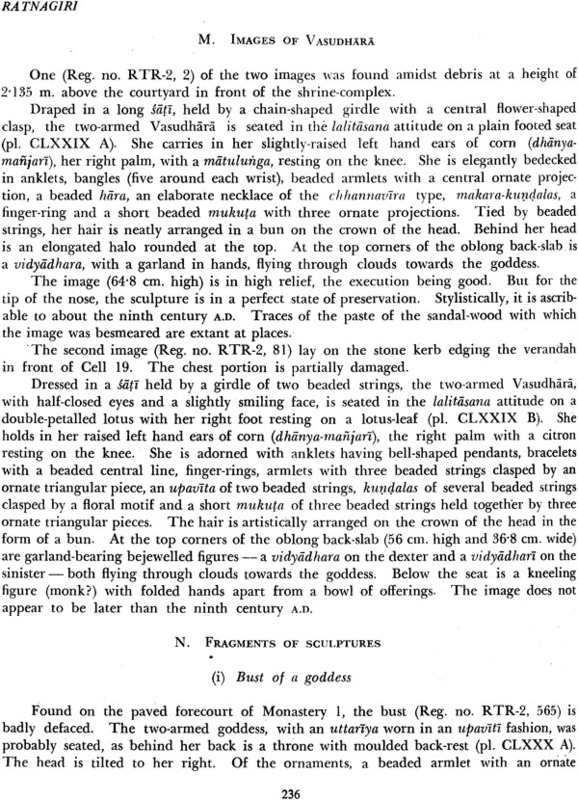 While writing this preface my mind automatically goes back to those seasons when the local people of the Ratnagiri village came forward to participate, directly or indirectly, in the excavations. I am fortunate in having a very pleasant people around me at the time of the excavation and I am reminded of what Sir John Marshall once wrote: ‘let us not forget that it is to the toil and sweat of the diggers that, first and foremost, we owe the vast majority of our archaeological treasures’. 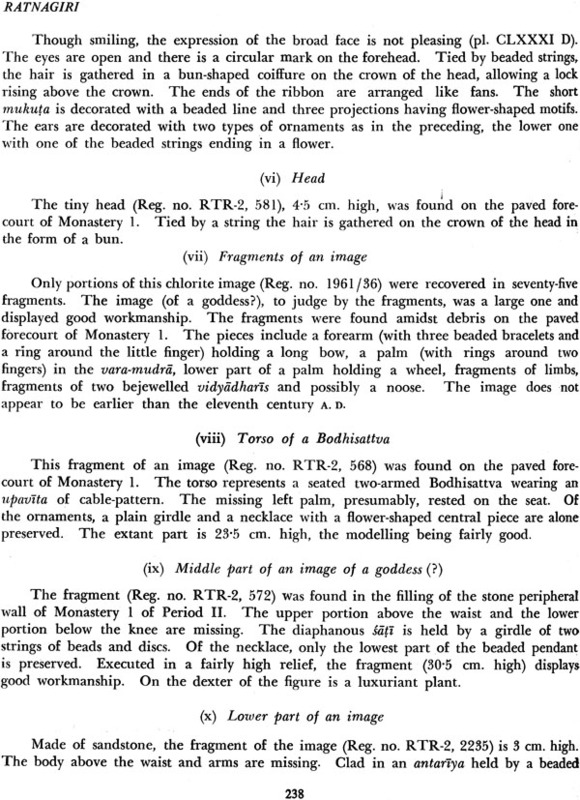 The second volume of Ratnagiri (1958-61) deals with Monastery 2, Area in front of Monastery, Area to the south-east of Monastery I, a single-winged monastery, bronze, copper and brass objects, sealings and impressions of monastic seals of Ratnagiri-mahavihara, miscellaneous sealings, plaques, moulds and a stamp, slabs with the text of the Partityasamut‘ pada-sutra and sculptures found on the surface. 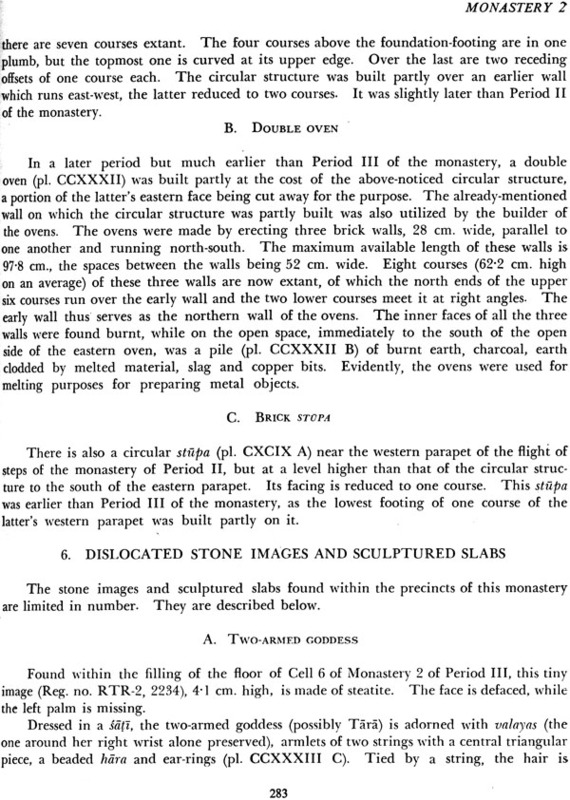 Readers may recall that in the first volume furnished the objective of the excavation, the description of the site and its environs, -:us notices, historical survey and religious background and full details of the excavated Stupa-area and Monastery I with their structural remains, monolithic stupas and stone sculptures unearthed. Once again I thank all the members of the team of the Archaeological Survey who toiled with me in the field at the time of the excavation and the village-people who helped us in every possible way. I am particularly beholden to Shri Kalachand Das, Photographer ‘a mired), Shri Ranjit Datta Gupta, Photo Officer (now retired), Shri Raj Kumar — Senior Photographer, Shri Kamal Kumar Biswas, Surveyor, Shri Sanat Kumar - Serveyor, Shri Lalit Kumar Jam, Drawing Officer and Shri Saktipada Chatterjee, Artist, who prepared illustrations for the publication. 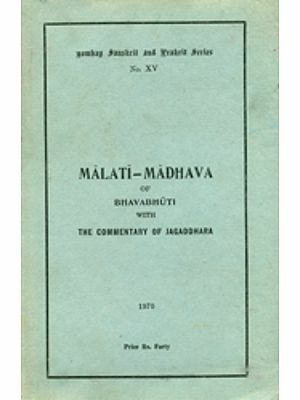 I am also thankful to Shri S. Ganesha Rao, Draftsman of the Survey, for conversion of measurements into metric system in both the volumes and to Shri Brij Bhushan Datta for typing out the entire manuscript. 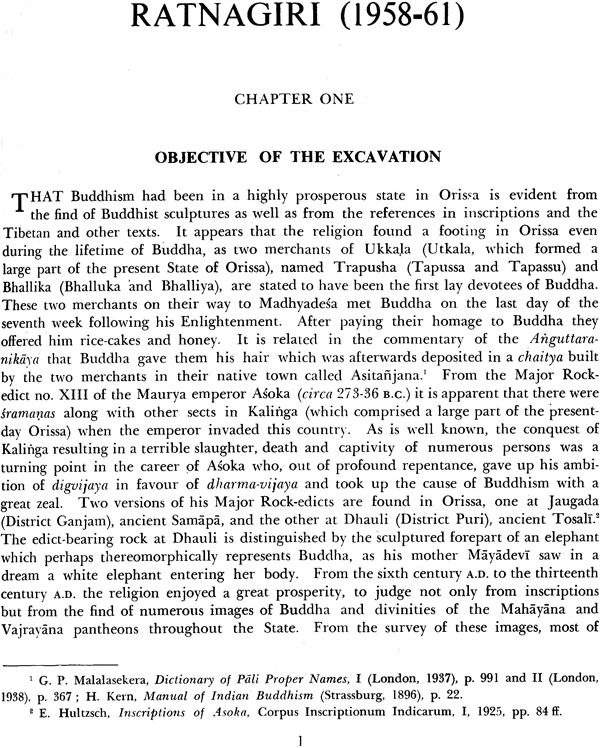 I record my appreciation to Shri Chhering Dorje, Deputy Superintending Archaeologist, for assistance with the proof-reading in the initial stage. 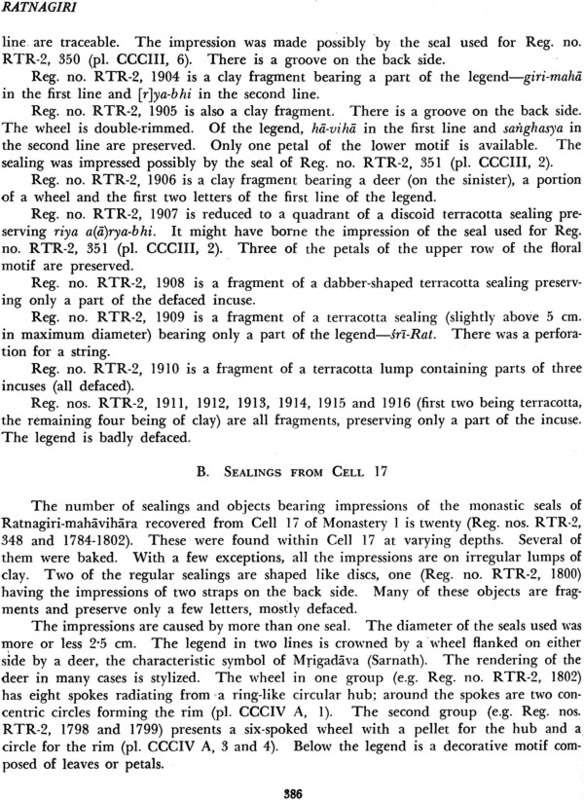 -‘ thanks are also due to Shri S. R. Varma, Administrative Officer of the Publication of the Archaeological Survey, who helped me in various ways while I was seeing this volume through the Press. Thanks to the cooperation of the Press, this volume could be brought out within two years from the publication of the first. I take this opportunity to express my grateful thanks to Shri N. K. Gossain of Messrs N. K. Gossain S Co. Private Ltd., Calcutta, for the keen • ken by him at even stage of printing. My daughter Dr. Mallar Ghosh assisted me in proof-reading all through.